You are here: Home / Precautions / How Safe is the Ice? 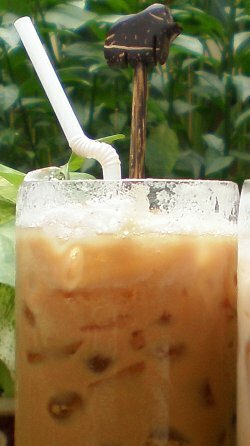 Following on from my article on Thai iced coffee, a reader asked me whether it is safe to take ice in your drinks when visiting Thailand. I remember when I first came here being advised by different expats that you should only take ice in your drinks if it is one of the round, cylinder type cubes that has a hole in. The reason given was that these type of ice cubes are commercially produced in hygienic conditions. I noted the advice when I was on holiday, but when I went to live in Thailand, I was less cautious in my approach to taking ice in my drinks. Like many others, I drink iced coffee, iced tea and fruit drinks regularly from street vendors in Thailand and have never had a problem. Personally, it has never been an issue for me, but for young children or those with a sensitive stomach, is it wise to be careful when it comes to iced drinks? The vast majority of ice used in Thailand is produced commercially in hygienic and safe conditions from clean water. To be extra cautious, the advice about sticking to cubes with holes in is reasonable advice. In restaurants, bars and clubs you will invariably be served ice in the form of cubes and there is no need to worry. The potential problems that can sometimes occur are with the ice that is transported in blocks. Although this ice is also hygienically produced, there can sometimes be an issue with the way it is transported which can involve wrapping the ice in nylon-type sacks to keep them cool before they are placed on the back of a pick-up truck. However, I don’t want to overplay any potential risks. If a restaurant or street vendor is popular with Thai clientèle, it’s a safe bet that the produce is good and safe to eat or drink. Depending on what drink you are ordering, the ice isn’t always automatically added. The vendor may ask if you want ice by saying ‘ao nam keng?’ If you don’t want ice, you can say ‘mai ao nam keng’. When it comes to taking ice in your drinks or not, it will have to be a personal decision. If in doubt, leave it out. That said, in my opinion it would be a shame to miss out on a delicious iced coffee from a street vendor just to opt for an overpriced iced mocha at the nearby Starbucks where the ice probably comes from the same supplier!